Washington Redskins logo. Source: Wikipedia. Baseball season has just begun and NHL hockey is entering its final push before the playoffs begin at the end of the month. 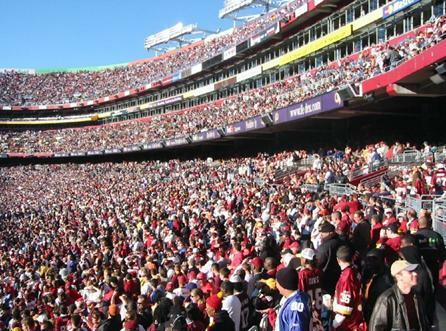 However, in recent months the attention has remained on the NFL’s Washington Redskins. Not because of their valiant post-season effort that ended with a horrific knee injury to their talented and budding young quarterback, but because of the team’s name and logo. The controversy over the team’s racist name and emblem is not new and is part of a much longer narrative of how professional sports teams have appropriated Aboriginal imagery and how First Nations have been depicted in derogatory or racist ways. The National Congress of American Indians estimates that fewer than 1,000 schools (secondary and collegiate) still use derogatory Aboriginal imagery and logos in their sports programs. While this figure represents an overall decrease of about two-thirds in the past fifty years, this number is still far too high. Moreover, many of these relics that still exist are most visibly seen at the professional level where they continue to perpetuate the misrepresentation of Aboriginal peoples. The use of Aboriginal terms or symbols to market food or other products has had a longstanding history in both Canada and the United States. In Daniel Francis’ book, The Imaginary Indian: The Image of the Indian in Canadian Culture (1992), he discusses how companies appropriated Aboriginal culture and symbols since the nineteenth century to help market products as diverse as medicine, food, and oil. With the increasing popularity of amateur, professional, and collegiate sports teams, squads also branded their teams after Indian groups in an attempt to associate the team with the perceived courage, ferocity, and strength of Indians. Defenders of this misguided process argued that this was and still is a way for teams to honour Native Americans and their culture. Unfortunately, these types of “honours” nearly always depict Aboriginals as stereotypical representations with characteristics such as bravery, physical prowess, and power. Aboriginals are never portrayed in contemporary fashion nor have teams selected other, more fitting qualities like intelligence or generosity to represent their so-called “Indian” mascots or logos. The problem with this type of advertising or branding scheme is that it reinforces the idea that the best Indian is the historical Indian. Consequently, this has led people to misuse and misrepresent Aboriginals in sport culture, which in turn has propagated a misunderstanding of Aboriginal people in general. The controversy in Washington is nothing new and dates back to the early 1990s. The Redskins originated in 1932 as the Boston Braves, eventually becoming the Boston Redskins. Following a four-year stint in Beantown, the Redskins moved to Washington. Opposition against the Redskins first occurred in 1992 when a group of Native Americans filed a lawsuit against the team. Unfortunately, the case was ultimately dismissed after the Supreme Court refused to hear it. Shortly thereafter, the Redskins’ then-owner Jack Kent Cooke attempted to build a new stadium for the team in D.C. In an effort to stall the move without a discussion of a possible name change, Senator Ben Nighthorse Campbell introduced legislation that would have required the Redskins to alter their name before breaking ground on a new stadium. Consequently, an unwilling Cooke moved the construction of a new arena outside of the city to Landover, Maryland, where the team still plays today. 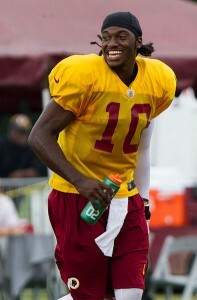 RG3 at training camp in July 2012. Source: Wikipedia. The debate over Washington’s name has been reignited recently. The team was back in the spotlight following the breakout season of rookie quarterback, Robert Griffin III (known best as RG3). In January, Washington D.C. mayor Vincent Gray stated that he would love to see the team return to the city, but such a move would require a significant discussion about a name change. And, in February 2013 the Smithsonian’s National Museum of the American Indian held a symposium, “Racist Stereotypes and Cultural Appropriation in American Sports.” The event not only continued the dialogue about these issues but also included Native Americans in the discussion. Most of the chatter in the mainstream and sporting media about the topic of renaming or rebranding the team has been generated by white men. If any positive steps are to be taken, Native Americans must be part of the discussion, especially since they are most pointedly affected by the issue. The debate surrounding the name may seem prosaic. Yet the issue reflects important questions about Aboriginal sovereignty. It would be a particularly important victory if Native Americans were to convince the Washington Redskins to change their name. Such an action would grant them sovereignty in the sense that they would have greater power in determining how they are portrayed and depicted, especially negative cases on the national level. If this were any other ethnic group, would these types of representations and blatant racist stereotypes be allowed to continue? If not, then why have we allowed this to continue with Native Americans? Many people are still unwilling to open a dialogue about name change in Washington and elsewhere. Such a position argues that doing so would betray a team’s history. However, when these teams were originally created it might have been more socially acceptable and as a result people embraced and celebrated these team names and logos. But these clubs do not operate in a vacuum and they must be willing to adapt in order to meet changing societal mores. Fans who argue that the “logo has been around forever” or that “it’s too late for change” should understand the underlying issues and recognize the problem. The fact of the matter is that professional teams have renamed and rebranded themselves and they did not self-destruct. Incidentally, one of the more well-known examples of a professional sports team changing its name and logo occurred in Washington, D.C. in 1995, when the NBA’s Washington Bullets became the Wizards. Then-owner Abe Pollin felt uncomfortable with the violent undertones of the name, which was exacerbated by D.C.’s high violent crime and homicide rate. The Wizards survived under their new banner – Hall of Famer Michael Jordan even played for them from 2001 to 2003. The team’s decline in recent years is attributable to bad basketball and not a different identity. Fans at FedEx Field in October 2003. Source: Wikipedia. Despite the encouraging dialogue in Washington in February, my sense is that we will not see a name change anytime soon. Many teams have cited financial loss as a reason for their opposition to change, yet Forbes estimates that the Redskins are the second most valuable franchise in the NFL. With a total worth of $1.56 billion, they are easily one of the most well-known football teams in the world. While a rebranding might impinge upon short-term revenue generation or brand recognition, the overwhelming majority of sports fans embrace the players and what the team does on the field. While a team’s identity is clearly significant to the fan base, it is unlikely that a change to name or logo would drive fans into the arms of rival NFC clubs. Now is the optimal time for a change; the team’s future looks bright with the young and charismatic RG3 at the helm, who significantly helped the team turn around their football woes, guaranteeing fan loyalty for years to come. Changing the name would not have to be that seismic either. The team’s current owner, Dan Snyder, actually trademarked the name “Warriors” when he was trying to bring arena football to Washington back in the late 1990s. “Washington Warriors” has a nice alliterative fit, and could keep its colour scheme of burgundy and gold, although the logo would need to be replaced. The most problematic part of the logo and team name is the fact that the ideas of colour and race are inseparably intertwined. The idea of designating race by colour might have been ubiquitous in the United States, and even Canada, during early twentieth-century, but in today’s world this practice is archaic and should not continue to be entrenched as part of one of the most visibly recognized sports franchises in the world. The easiest solution would be to drop “Red” and just become the Washington Skins, a shortened form for “pigskin,” which would do away with the racist element and allow for the incorporation of the most valuable part of the game into the log and name: the football. Personally, I’d be in favour of a complete rebranding in keeping with the District’s other sports teams, MLB’s Washington Nationals and the NHL’s Washington Capitals. Renaming the Redskins something like the “Federals” would honour D.C.’s historic roots and fit within the broader theme of the city’s other sporting franchises. If the Washington Redskins do move forward, it would set an enormous precedent and be a resounding first step in ending the use of derogatory and racist terms linked with Indigenous peoples once and for all. Having this type of historic change emanate from the nation’s capital might be enough to prompt other teams, like the Cleveland Indians, Atlanta Braves, and the Chicago Blackhawks to do away with their racist and antiquated imagery as well. Interesting and timely article, Mike, espeically in regards to the recent fiasco surrounding the naming of the new Ottawa NBLC basketball team. Initially, the owners wanted to name the team the “Ottawa Tomahawks” claiming that the word “tomahawk” isn’t an apropriation of indigenious cultures but instead a reference to a one handed dunk–ignorning, of course, where the dunk got its name. It was intriguing to see the arguments put foward by supporters given that the traditional points about long standing names were not available. Hey Pete, thanks! I had actually read about that issue in Ottawa and thought the same thing. I wanted to incorporate it into the piece to offer some Canadian context but I kind of ran out of time and space. Great article. It annoys me that team owners use the excuse that they will lose money from a rebranding effort. If anything, they’ll likely generate a ton of revenue from merchandise sales featuring the new logo. Time and time again, consumers have proven that they’ll spend the money for any change whether it be a special event like All Star Games, the Winter Classic and especially evident in the Jays new logo. Hi Adam, thanks for your comments and I’d have to agree. I can personally attest to this as when I was in Toronto last week for a conference I trekked out on a break in order to buy the Jays “maple leaf” batting practice hat that they debuted this year. Given the expansive fan bases that these teams have I would highly doubt the fans would not rally around the new logo and identity and as you say purchase the new merchandise as soon as it hits the shelves. Great article Mike! The controversy about the team naming in Ottawa is one of many rich stories about this issue. Characterization of the timelessness of Indigenous representation is central to Indigenous cultural appropriation and essentialism–well made point! Hey Darren, good to hear from you, hope all is well and thanks for the comments. Perhaps a follow-up to this post with a focus on the Ottawa discussion should be in the works down the road. Enjoyed this article very much. I have always believed it is a disgrace that the team representing our (I am American) nation’s capital is a racist slur. Likewise, the logo for the Cleveland baseball team is insulting. I am amazed at how these teams are allowed to keep them – this would not happen if these names / logos were offensive to any other ethnic group. Hey Adam, yes I actually saw that too. I remember hearing about it when spring training started but then again today when I was looking up the “Tomahawk chop” clip I came across it again. Kind of outrageous they were seriously contemplating a reversion back to the “screaming savage” logo as it was called. Great piece. I’m actually thinking about working on a piece discussing these various issues in thee Canadian context. I would like to pick your brain on this. Have you thought about we extending your analysis to the Canadian case in light of the recent hr claim in Ottawa?